Description Please shorten the plugin's description field. It is customary for plugins to present their human-friendly name and a short description in the "[Plugin Manager|http://localhost:8080/pluginManager/installed]" page on Jenkins. e.g. the "[envinject|https://plugins.jenkins.io/envinject]" plugin has a human-friendly name of "Environment Injector Plugin" and a description of "This plugin makes it possible to set an environment for the builds. ", resulting in a concise entry in the Plugin Manager WebUI (see "example-short-description.png" for screenshot). e.g. the "[envinject|https://plugins.jenkins.io/envinject]" plugin has a human-friendly name of "Environment Injector Plugin" and a description of "This plugin makes it possible to set an environment for the builds. ", resulting in a concise entry in the Plugin Manager WebUI (see "[example-short-description.png|https://issues.jenkins-ci.org/secure/attachment/40679/example-short-description.png]" for screenshot). e.g. the "[envinject|https://plugins.jenkins.io/envinject]" plugin has a human-friendly name of "Environment Injector Plugin" and a description of "This plugin makes it possible to set an environment for the builds. ", resulting in a concise entry in the Plugin Manager WebUI (see "[example-short-description.png|https://issues.jenkins-ci.org/secure/attachment/40680/example-short-description.png]" for screenshot). The plot-plugin, however, has a lengthy description which bloats out the Plugin Manager page (see "[current-too-long-description.png|https://issues.jenkins-ci.org/browse/JENKINS-48537?page=com.atlassian.jira.plugin.system.issuetabpanels:all-tabpanel]" for screenshot). I would suggest that this text be truncated at the end of the first sentence, resulting in something like "[suggested-shortened-description.png|https://issues.jenkins-ci.org/secure/attachment/40678/suggested-shortened-description.png]", and the rest of the text placed in the plugin's wiki page or (preferably) within the online help built into the plugin itself for the Post-build Action "Plot build data". 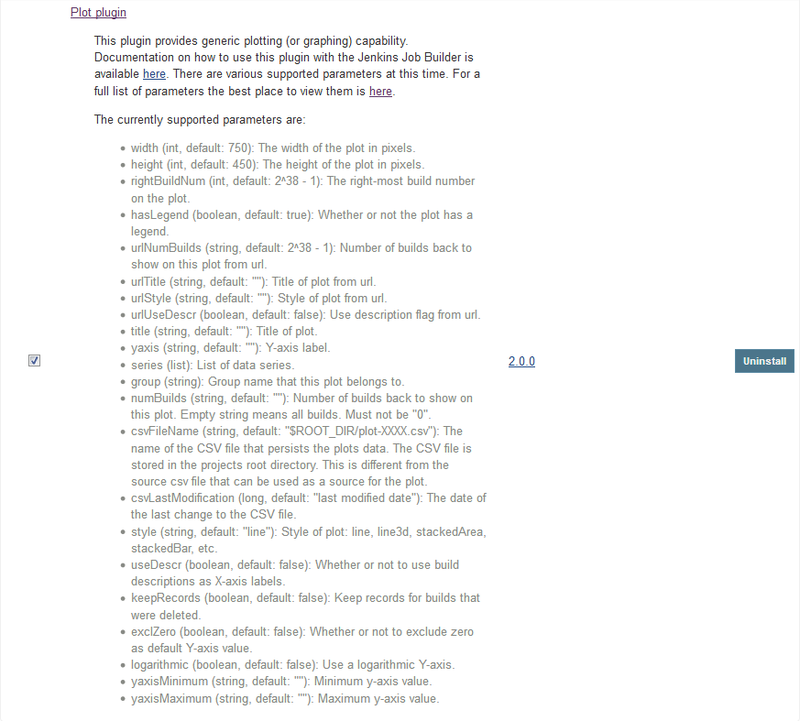 The plot-plugin, however, has a lengthy description which bloats out the Plugin Manager page (see "[current-too-long-description.png|https://issues.jenkins-ci.org/secure/attachment/40679/current-too-long-description.png]" for screenshot).